To me, there aren’t many better combinations than banana + dulce de leche. 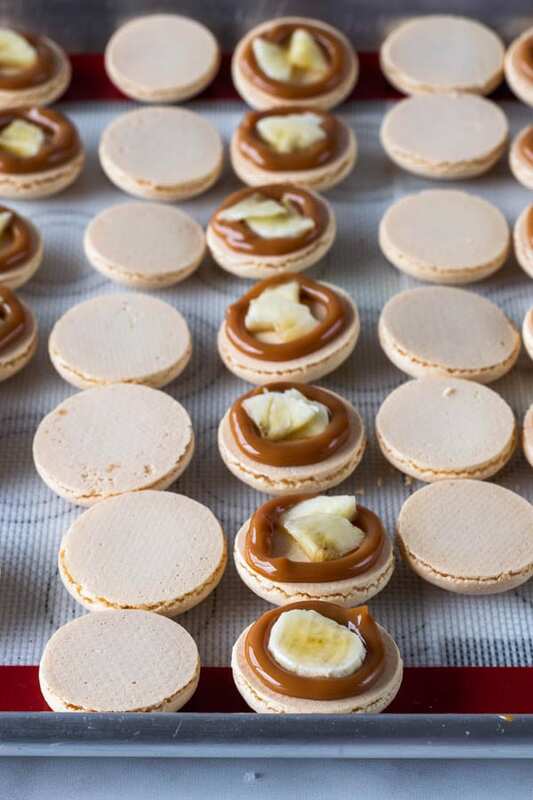 And that’s why I bring these Banoffee Macarons to the party today. 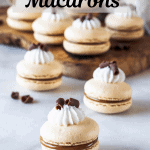 Also, some tips on how to make macarons! Let’s begin by talking about these beauties. 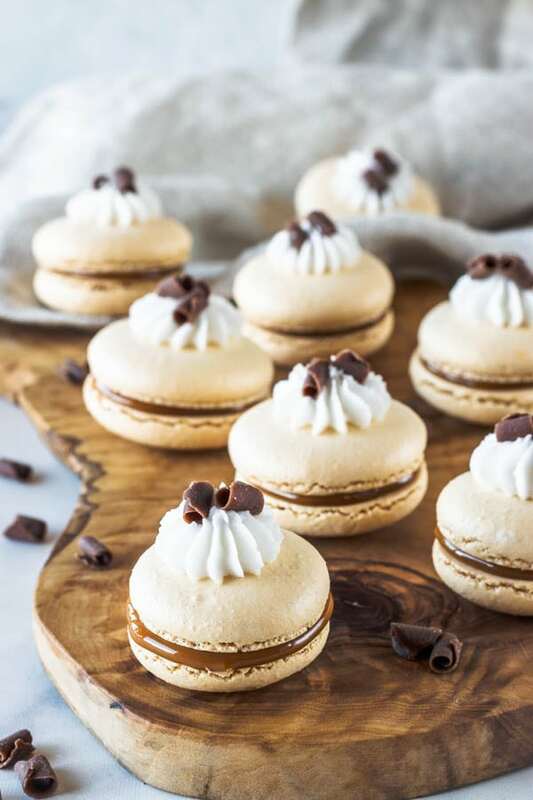 These Banoffee Macarons are filled with dulce de leche and banana. Topped with whipped cream and chocolate curls. 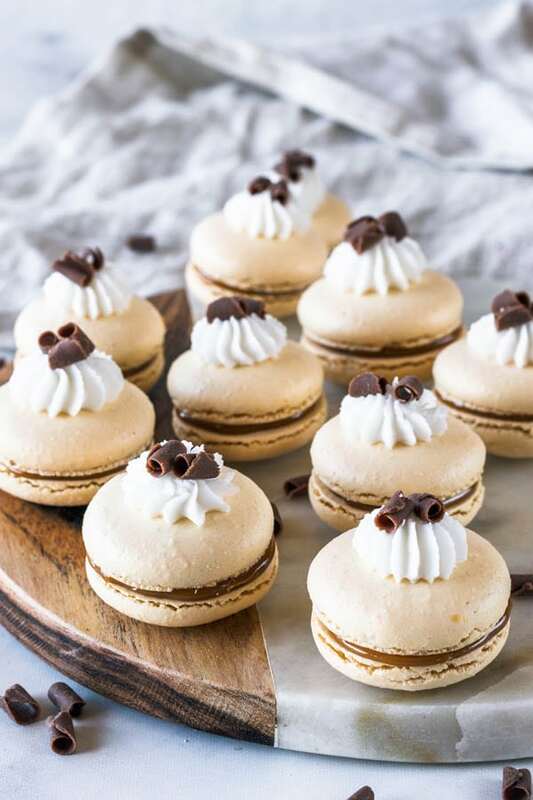 Here are the chocolate curls I used in my Banoffee Macarons. They’re simply awesome. I’ve used them in another recipe as well (coming soon!). Ps. it also involves banana + dulce de leche! Guys, you might not be able to tell, but I had some problems with these Banoffee Macarons, actually. I made a mistake while making the batter. And I totally did it because I wasn’t paying my fullest attention to making the macarons. I overwhipped my meringue in the beginning. 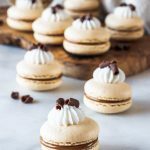 What happens if you overwhip the meringue when making macarons? Well, I overwhipped the macarons slightly. When I turned off my mixer, the egg whites were starting to clump up. If your egg whites start to clump up, or form a ball around the whisk, you’re probably overwhipping your meringue. 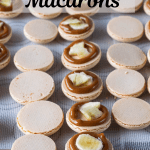 This is a huge tip about making macarons. Be really careful not to overwhip your meringue. Stop before the whites clump up and form a ball around the whisk. When ready, your meringue tips should be resembling birds curvy beaks, but still stiff and holding their shape. Anyway, my mistake of overwhipping the meringue when making my Banoffee Macarons, had two consequences. First- The feet of the macarons are a little bit off, kind of retracted, they didn’t fully rise. The feet of the macarons kind of resemble cracks at the edge of the shell. Second- Since my meringue overwhipped, the batter was kind of stiff when folding, making me work a little bit harder. As I kept folding, the batter was becoming too liquid, but it still wasn’t turning smooth when piped, leaving lots of peaks, and deformities in the shells. Based on this, I can recommend three major tips on making macarons today. As discussed above, just don’t overwhip your meringue. Besides both of the consequences I described (undeveloped/weird feet, and uneven surface), your macarons may also turn hollow from overwhipping your meringue. …to every single step of the recipe when making macarons, stay present, bring your strong energy to the game, or a lot can go wrong. The slightest lack of engagement when making macarons can lead to problems. I turned my back for one second to put some dishes away, lost track of time, and bam, overwhipped meringue. I know my macarons didn’t turn out completely perfect this time. And I even thought about tossing them, at first. But then I decided to make the best of it, come here and tell you all, my fellow macaron baker friends, what can happen when you overwhip your meringue when making macarons. Whenever you are faced with a failure, or a challenge, you have two options: let it upset you, or make it a way of learning happen. And here I am trying to make this learning happen for myself and also for you. 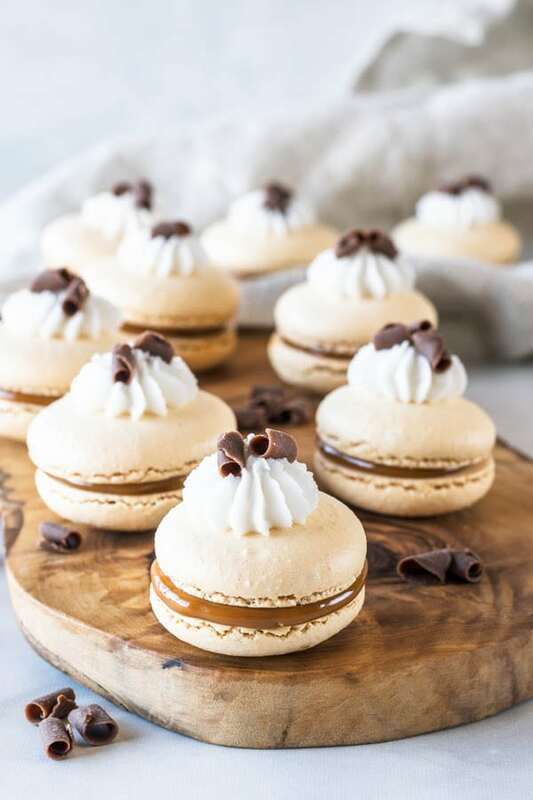 The filling in these Banoffee Macarons is simply sliced banana and dulce de leche, which can be store bought, or made at home, just read the instructions down below. Make sure the banana slices are very thin so you can easily place the top shell on the macaron, and it won’t be crooked. I would not recommend freezing these macarons, as the bananas in the middle might become too sticky, dark in color. And the whipped cream on top also won’t be able to withstand the freezing/thawing. 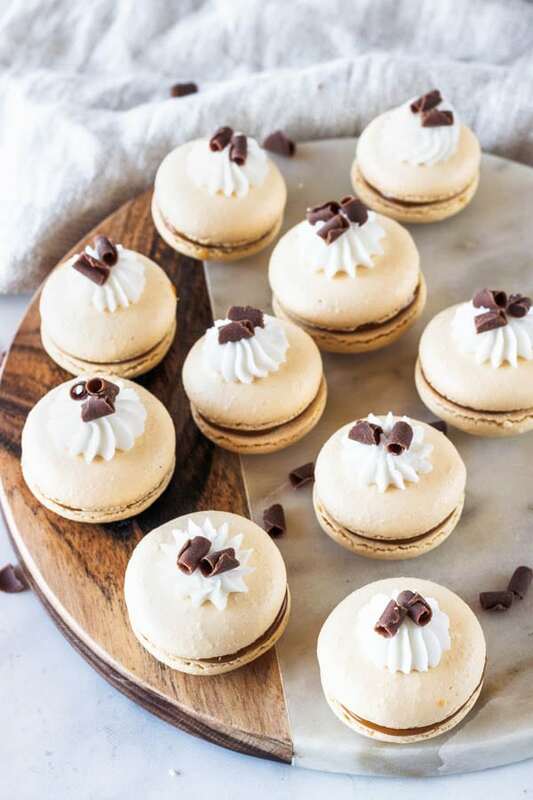 You can still freeze the unassembled shells, and just assemble the day before you serve these macarons. It’s always best to let macarons mature overnight before serving them. For taste and texture sake. 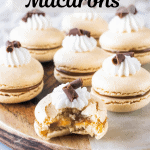 Want to see more macaron recipes and tips? Stay tuned for my eBook coming out during summer. Subscribe to my blog, on the side bar to get any notifications of new posts. 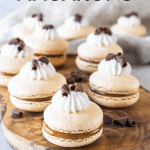 Or, just check my huge Macaron section on my blog, with tones of macaron recipes, ideas, macaron tricks, tips on how to make french macarons, and more. Thank you so much for reading my blog. Have a great day! 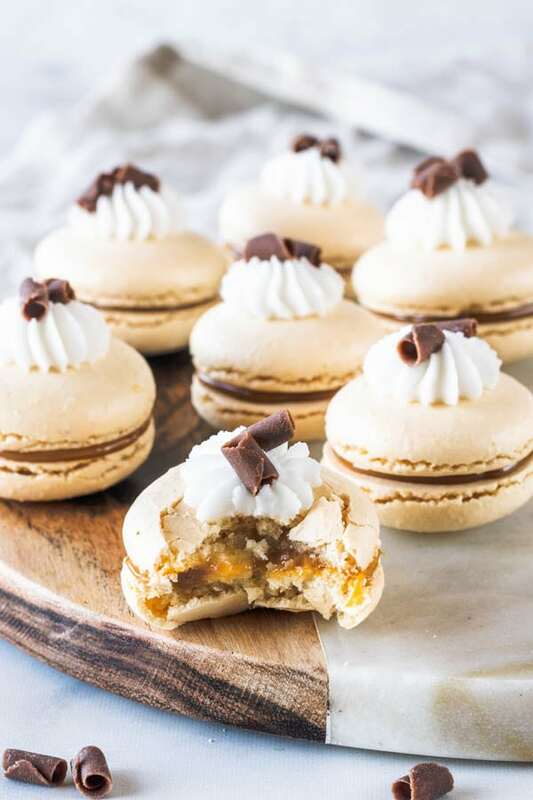 These Banoffee Macarons are filled with banana and dulce de leche. Topped with whipped cream for an extra delicious touch! Line two baking sheets with parchment paper or silicone mat. I use a baking mat with the macaron template already in it. There are places you can print your own, and just place it under silicon mat, or parchment paper. Once you’ve piped as many circles as you could, bang the trays against the counter a few times each. This will release air bubbles that are in the batter and prevent your macaron shells from cracking. Bake for around 4 minutes or so. Really keep an eye out, not to overbake. Whip heavy cream with powdered sugar on high until it achieve stiff peaks, about 1 minute or so. Place it in a piping bag. Pipe a circle of dulce de leche around the edges of the macaron, in a way that you have a little hole in the middle. Fill the little hole with a couple slices of banana. Don’t overfill it. Place another shell on top. 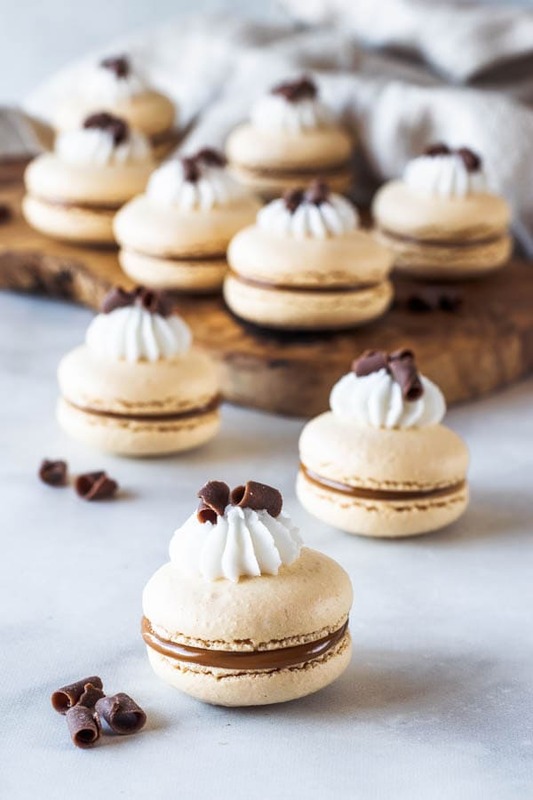 Pipe some whipped cream on top of the macarons, and then top with the chocolate curls, or chocolate shavings. 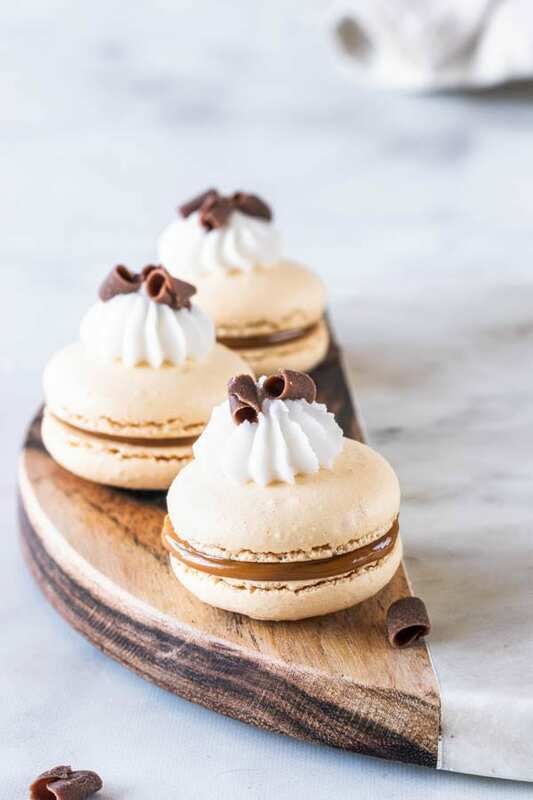 These Dulce de Leche Walnut Macarons are best stored for up to 7 days in the fridge. If you want to freeze them, just make sure to package them really well, in a container in the freezer, and keep it for 1 month. Só de olhar já estou com água na boca, que Macarons sensacionais!!!! !